Azure CLI を使用して、Azure Data Lake Analytics のアカウント、データ ソース、ユーザー、およびジョブを管理する方法について説明します。Learn how to manage Azure Data Lake Analytics accounts, data sources, users, and jobs using the Azure CLI. 他のツールを使用する管理のトピックを表示する場合は、上のタブ セレクターをクリックします。To see management topics using other tools, click the tab select above. Azure サブスクリプション。An Azure subscription. Azure 無料試用版の取得に関するページを参照してください。See Get Azure free trial. Azure CLI。Azure CLI. 「 Azure CLI のインストールと構成」をご覧ください。See Install and configure Azure CLI. このデモを完了するためには、 プレリリース版の Azure CLI ツール をダウンロードしてインストールします。Download and install the pre-release Azure CLI tools in order to complete this demo. az login コマンドを使用して認証し、使用するサブスクリプションを選択します。Authenticate by using the az login command and select the subscription that you want to use. 職場か学校のアカウントを使用した認証の詳細については、「 Azure CLI から Azure サブスクリプションへの接続する」をご覧ください。For more information on authenticating using a work or school account, see Connect to an Azure subscription from the Azure CLI. Data Lake Analytics ジョブを実行するには、Data Lake Analytics アカウントが必要です。Before running any Data Lake Analytics jobs, you must have a Data Lake Analytics account. Azure HDInsight とは異なり、ジョブを実行しなければ、Analytics アカウントには課金されません。Unlike Azure HDInsight, you don't pay for an Analytics account when it is not running a job. ジョブの実行時にのみ課金されます。You only pay for the time when it is running a job. 詳細については、「 Azure Data Lake Analytics の概要」を参照してください。For more information, see Azure Data Lake Analytics Overview. az dla account create --account "<Data Lake Analytics account name>" --location "<Location Name>" --resource-group "<Resource Group Name>" --default-data-lake-store "<Data Lake Store account name>"
az dla account list "<Resource group name>"
az dla account show --account "<Data Lake Analytics account name>" --resource-group "<Resource group name>"
az dla account delete --account "<Data Lake Analytics account name>" --resource-group "<Resource group name>"
Analytics アカウントを作成する際には、既定のストレージ アカウントとして Azure Data Lake Storage アカウントを指定する必要があります。When you create an Analytics account, you must designate an Azure Data Lake Storage account to be the default storage account. 既定の Data Lake ストレージ アカウントは、ジョブ メタデータとジョブ監査ログの格納に使用されます。The default Data Lake storage account is used to store job metadata and job audit logs. Analytics アカウントを作成したら、さらに Data Lake Storage アカウントや Azure Storage アカウントを追加することができます。After you have created an Analytics account, you can add additional Data Lake Storage accounts and/or Azure Storage account. az dla account show コマンドを実行することで、使用される既定の Data Lake Store アカウントを表示できます。You can view the default Data Lake Store account used by running the az dla account show command. 既定のアカウント名は defaultDataLakeStoreAccount プロパティの下に表示されます。Default account name is listed under the defaultDataLakeStoreAccount property. az dla account show --account "<Data Lake Analytics account name>"
az dla account blob-storage add --access-key "<Azure Storage Account Key>" --account "<Data Lake Analytics account name>" --storage-account-name "<Storage account name>"
BLOB ストレージの短い名のみがサポートされます。Only Blob storage short names are supported. "myblob.blob.core.windows.net" などの FQDN 名は使用しないでください。Don't use FQDN, for example "myblob.blob.core.windows.net". az dla account data-lake-store add --account "<Data Lake Analytics account name>" --data-lake-store-account-name "<Data Lake Store account name>"
az dla account blob-storage update --access-key "<New Blob Storage Account Key>" --account "<Data Lake Analytics account name>" --storage-account-name "<Data Lake Store account name>"
az dla account data-lake-store list --account "<Data Lake Analytics account name>"
az dla account blob-storage list --account "<Data Lake Analytics account name>"
az dla account data-lake-store delete --account "<Data Lake Analytics account name>" --data-lake-store-account-name "<Azure Data Lake Store account name>"
az dla account blob-storage delete --account "<Data Lake Analytics account name>" --storage-account-name "<Data Lake Store account name>"
ジョブを作成するには、Data Lake Analytics アカウントが必要です。You must have a Data Lake Analytics account before you can create a job. 詳細については、「 Data Lake Analytics アカウントの管理」を参照してください。For more information, see Manage Data Lake Analytics accounts. az dla job list --account "<Data Lake Analytics account name>"
az dla job show --account "<Data Lake Analytics account name>" --job-identity "<Job Id>"
ジョブの既定の優先度は 1000 で、ジョブの並列処理の既定の次数は 1 です。The default priority of a job is 1000, and the default degree of parallelism for a job is 1.
az dla job submit --account "<Data Lake Analytics account name>" --job-name "<Name of your job>" --script "<Script to submit>"
list コマンドを使用してジョブ ID を検索した後、cancel を使用してそのジョブを取り消します。Use the list command to find the job id, and then use cancel to cancel the job. 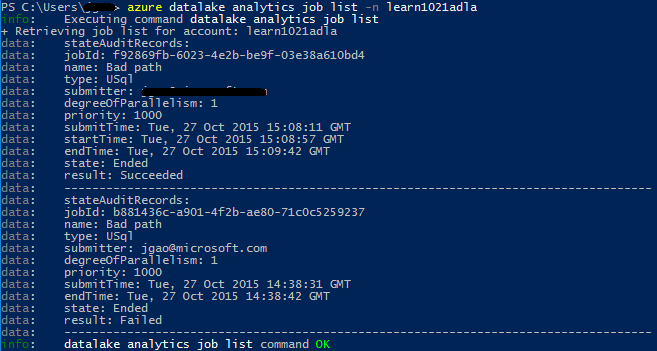 az dla job cancel --account "<Data Lake Analytics account name>" --job-identity "<Job Id>"
az dla job pipeline コマンドを使って前に送信したジョブのパイプライン情報を確認します。Use the az dla job pipeline commands to see the pipeline information previously submitted jobs. az dla job pipeline list --account "<Data Lake Analytics Account Name>"
az dla job pipeline show --account "<Data Lake Analytics Account Name>" --pipeline-identity "<Pipeline ID>"
az dla job recurrence コマンドを使って前に送信したジョブの繰り返し情報を確認します。Use the az dla job recurrence commands to see the recurrence information for previously submitted jobs. az dla job recurrence list --account "<Data Lake Analytics Account Name>"
az dla job recurrence show --account "<Data Lake Analytics Account Name>" --recurrence-identity "<Recurrence ID>"